For Liam Balneaves, pictured right, it really was a day to remember on the famous Ayrshire links as he produced one of the stories of the week. While more fancied players continued their progress, the scratch handicapper composed a remarkable round to beat Rory Smith from Dalmahoy 4 and 3. The 29-year-old hails from Invercargill but has been living in Scotland for the last four years, with his mum and dad both born here. Working out of the famous Auchterlonie's golf shop in St Andrews, he has kept his eye in on the golf course, ahead of returning to his native New Zealand next month. That was never truer than at a rainy Prestwick where he produced the third hole-in-one of his golfing life at the second hole with a well-struck 8-iron, before holing from 145 yards with a 9-iron for an eagle at the 12th. His opponent, Smith, probably didn’t know whether to laugh or cry. Elsewhere, top-ranked players also handled the conditions. There were comfortable early second-round victories for favourites Craig Howie (Peebles) and Sandy Scott (Nairn), who have now set up a mouthwatering meeting in the opening match of the last-32. Howie, a former Scottish boys champion, has one goal in mind this week – simply to win. “I played pretty solid, didn’t make too many mistakes,” he said. “I’m loving the course, it’s quirky, but it really tests your ball striking. 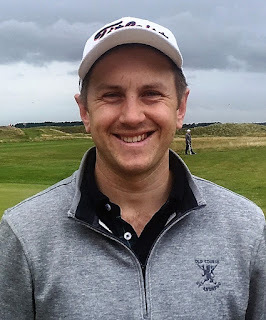 Craig’s younger brother, Darren, was also a notable winner, taking out fellow Scotland international Rory Franssen from Inverness with a 3 and 2 triumph. Kirkhill’s Craig Ross continued his progress, as did Ryan Lumsden from Royal Wimbledon, who represented Scotland in the recent European Amateur Team Championship. While Walker Cup captain Craig Watson from East Renfrewshire bowed out, losing 3 and 2 to young Calvin Cheyne from Newmachar, another intriguing story could unfold as Australia-based Scot Robbie Morrison, who plays out of Royal Perth, progressed after beating Brendan McKenna (Pollok) 4 and 3. S Roger (Cruden Bay) bt N McConnachie (Balmore) 2 holes. G Telfer (Prestwick St Cuthbert) bt J Rogers (Rockliffe Hall) 5 and 3. N Gold (Bonnyton) bt R Gordon (Alford) 1 hole. C Low (Tantallon) bt S Manning (Pollok) 5 and 3. S Brown (Prestwick St Cuthbert) bt A Thomson (Lanark) 5 and 4. A Murray (Troon Welbeck) bt M Brodie (Alyth) 5 and 4. D Anderson (Lochwinnoch) bt C Telfer (Prestwick St Cuthbert) 2 and 1. S Scott (Nairn) bt E McBride (Lenzie) 4 and 3. C Howie (Peebles) bt C McGuigan (Comrie) 6 and 4. J Wright (Forres) bt H Gorn (Aberdour) at 20th. W Porter (Carnoustie) bt L Irvine (Kirkhill) 1 hole. S Locke (Banchory) bt D McNeill (Powfoot) 19th. M Smyth (Royal Troon) bt N Blyth (Germany) 4 and 3. J Wilson (Balmore) bt B McLeod (Musselburgh) 4 and 2. M Watt (Inverallochy) bt C Gaittens (Fortrose and Rosemarkie) 3 and 2. B Bannerman (Blairgowrie) bt E Wood (Crow Wood) at 20th. N H M Beattie (St Andrews) bt E McIntosh (Tiurnhouse) 4 and 3. S Stewart (Clydebank and Dist) bt A Thurlow (Murrayfield) 3 and 2. M Clark (Kilmacolm) bt S Buchanan (Prestwick St Nicholas) 4 and 2. A McDougall (Elderslie) bt E Walker (Kilmarnock Barassie) at 21st. C L Cheyne (Newmachar) bt C R Watson (East Renfrewshire) 3 and 2. A R Ni (Murrayfield) bt J McMorris (East Kilbride) 3 and 2. G Wishart (Lundin) bt S Blair (Royal Musselburgh) 4 and 3. S Easton (Irvine) bt L Breslin (Fereneze) 5 and 4. B Caldow (Kilmarnock Barassie) bt J Johnston (Ayr Belleisle) 1 hole. D Howie (Peebles) bt R Franssen (Inverness) 3 and 2. L Balneaves (Carnoustie) bt R J Smith (Dalmahoy) 4 and 3. C Ross (Kirkhill) bt M Hislop (Glenbervie) 4 and 3. R Morrison (Australia) bt B McKenna (Pollok) 4 and 3. G Burns (Williamwood) bt Napier 3 and 2. Brown bt K Godsman (Moray) 1 hole. C Maclean (Balmore) bt Murray (Troon Welbeck) 1 hole. F Davren (Williamwood) bt Anderson 1 hole. C Fyfe (Cawder) bt Gault 4 and 3.